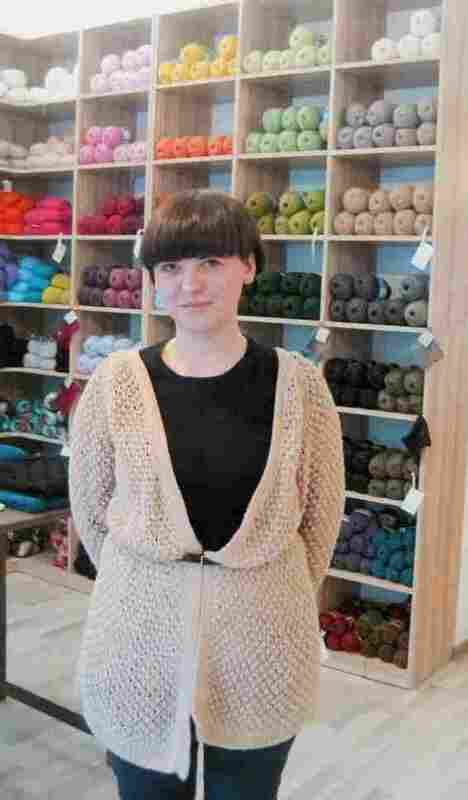 One Berliner Sees 'A New Renaissance' In Knitting After working in a law office in Lithuania, Ruta Sluskaite decided to open her own knitting store in Friedrichshain. Berlin Wollen offers a wide selection of wool, mainly from Lithuania, but also local wool from Brandenburg. Ruta Sluskaite is sitting in her store in Friedrichshain surrounded by tall shelves filled with wool. Hand-printed tote bags hang from the counter. A rack with knitted vests and sweaters and stitched art pieces adorn the walls. Sluskaite wears a beautiful crochet cardigan, of course her own creation. Berlin Wollen is the name of her small wool empire. "My idea was, I don't want to have this boring old wool shop with a lot of dust. I want to make it light with art where you can get inspired, and you can come here if you look for something special," Sluskaite says. Her mother was too busy to knit, Sluskaite says, but she learned the old-fashioned craft from her grandmother and aunts. "My Grandma- she was always knitting, and originally I am from Lithuania, and in the 90's there was nothing, so we had to make clothes by ourselves if we wanted to look better or different." Originally, I am from Lithuania, and in the 90's, there was nothing, so we had to make clothes by ourselves if we wanted to look better or different. Sluskaite studied law and worked in a law office in Lithuania. She always got compliments for her handmade accessories, so when her aunt lost her job, Sluskaite decided to start her own label and employed her aunt as one of her main knitters. "It's called 'Slow Sunday,'" Sluskaite says. "I wanted to do this slow handmade fashion movement. You can talk about slow food and fast food and you can talk about fast fashion and slow fashion. It fits very well because it's made with time, with love, and it's unique." Her store in Berlin carries a wide selection of wool, mainly from Lithuania, but also local wool from Brandenburg. Apart from selling her "Slow Sunday" collection, Sluskaite also promotes other young designers. 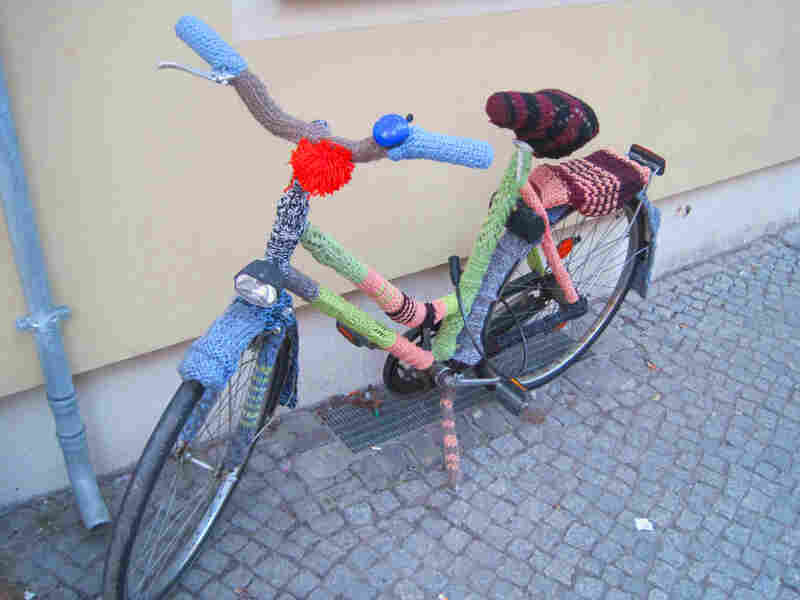 Berlin Wollen a meeting ground for people who want to create something with their own hands, whether it's a scarf, a sweater, knitted animals, or guerrilla-based knitting. Ruta Sluskaite's bicycle, clad in a colorful wool knit, sits in front of Berlin Wollen. Sluskaite also dressed her bike in front of her store in a colorful knit. "People doing this knit graffiti in ugly places, or in public places where they put knitted stuff around trees, it doesn't mean anything. They just want to make things nicer." Workshops at Berlin Wollen cater to the absolute beginners as well as advanced knitters. Sluskaite can make almost anything out of yarn or wool, even sneakers. As soon as the light mohair wool for spring and summer arrives, she predicts everyone will want to knit a dress or swimming suit. "Knitting has a new renaissance."